Goal Zero Torch 250 - Run time: 7 - 48 Hours. 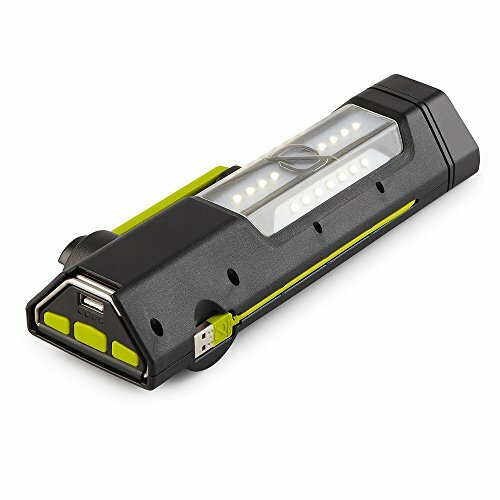 The torch 250 power hub and Flashlight is the most versatile, reliable source of power and light for any situation. Built-in solar panel, USB charging cable, and hand-crank for light anywhere. Long-lasting, advanced lithium 4400mAh battery and integrated USB port charges phones and boosts tablets to stay connected. Multiple light options that allow to use as a 250 total lumen output flashlight, floodlight or red emergency light. Built-in usb charging cable, solar panel and hand crank for bright light anywhere. Save on power with bright and half-bright modes. Red light for emergencies, USB port to charge your phone. Boasting a powerful, 4, 400 mAh lithium battery, 250 total lumen output, a 1. Goal Zero Torch 250 Flashlight, Lantern and USB Recharger with Integrated Solar Panel - 5a usb port to charge your gear, as well as a built-in solar panel and hand crank, this multi-function flashlight is the only piece of gear you'll need in an emergency. Goal Zero 32012 - Features three light settings and a flickering candle mode. A solar-powered lantern designed for convenience. Press and hold the on/off button for 10 seconds to get out of demo mode. There are two ways to charge the Crush Light: 1 Recharge the Crush Light from the sun with built-in solar panel. Hang it, light it, crush it. 2 charge from any usb port via included micro USB cable Light it. The crush light also features a soft, candle flicker mode for ambiance. Charge it. The crush light is as easy to store as it is to use, collapsing to just over half an inch. Please note: this light arrives in demo mode. In a pinch? it also charges from any USB port via micro USB cable included. Goal Zero Crush Light Solar Powered Lantern - Crush it. This collapsible solar powered lantern is a lightweight companion to any adventure with 60 lumens of usable light on high, and a 35 hour runtime on low. Just add sun and the crush light charges up through its built-in solar panel. Goal Zero 24004 - Plus high/low setting and integrated cord makes this the perfect light for every adventure. The crush light is as easy to store as it is to use, collapsing to just over half an inch. Please note: this light arrives in demo mode. Press and hold the on/off button for 10 seconds to get out of demo mode. Bright led light with 350 lumens, built-in carabiner and magnets so it's quick to hang anywhere. Adjustable shade design for broad area light or warm lantern light with high/low settings. New and improved! bright leD light with 350 Lumens, and adjustable shade for lantern or focus light. This collapsible solar powered lantern is a lightweight companion to any adventure with 60 lumens of usable light on high, and a 35 hour runtime on low. Goal Zero Light-A-Life 350 LED Light - Light it. Just add sun and the crush light charges up through its built-in solar panel. Requires a goal zero Sherpa Power Pack or Yeti Power Station. In a pinch? it also charges from any USB port via micro USB cable included. Crush it. Perfect for an outdoor camp or inside a tent. Chainable with up to 8 lights. Low-power draw for extended runtimes. Goal Zero 12004 - The crush light also features a soft, candle flicker mode for ambiance. Charge it. Optimal operating temp: 0-120 F -17-48 C. Press and hold the on/off button for 10 seconds to get out of demo mode. Bright led light with 350 lumens, built-in carabiner and magnets so it's quick to hang anywhere. Adjustable shade design for broad area light or warm lantern light with high/low settings. Perfect for an outdoor camp or inside a tent. Chainable with up to 8 lights. Low-power draw for extended runtimes. Highly efficient mono-crystalline solar pumps out more power per square inch. Requires a goal zero Sherpa Power Pack or Yeti Power Station. Built-in junction box with smart-charging chip, allows you to power handheld USB and 12 Volt gear from the sun. Goal Zero Nomad 20 Solar Panel - The nomad 20 solar panel combines highly efficient mono-crystalline technology in a foldable, portable, plug-and-play form. With a built-in junction box and innovative smart chip, the Nomad 20 can directly charge handheld USB and 12 Volt devices directly from the sun, just as fast as the wall. This collapsible solar powered lantern is a lightweight companion to any adventure with 60 lumens of usable light on high, and a 35 hour runtime on low. Patented chaining technology combines Goal Zero Nomad panels for faster charge times. Pair with any goal Zero power pack sold separately and charge gear day or night. Goal Zero 32005 - Foldable and portable for use anywhere. Press and hold the on/off button for 10 seconds to get out of demo mode. Bright led light with 350 lumens, built-in carabiner and magnets so it's quick to hang anywhere. Adjustable shade design for broad area light or warm lantern light with high/low settings. Optimal operating temp: 0-120 F -17-48 C.
Pair with any goal Zero power pack sold separately and charge gear day or night. Patented chaining technology combines Goal Zero Nomad panels for faster charge times. Just add sun and the crush light charges up through its built-in solar panel. In a pinch? it also charges from any USB port via micro USB cable included. Goal Zero Lighthouse Micro Flash USB Rechargeable Lantern - Crush it. Perfect for an outdoor camp or inside a tent. Chainable with up to 8 lights. Low-power draw for extended runtimes. Light it. The crush light is as easy to store as it is to use, collapsing to just over half an inch. Please note: this light arrives in demo mode. The crush light also features a soft, candle flicker mode for ambiance. Goal Zero 200BC - Just add sun and the crush light charges up through its built-in solar panel. Perfect for an outdoor camp or inside a tent. Chainable with up to 8 lights. Low-power draw for extended runtimes. This collapsible solar powered lantern is a lightweight companion to any adventure with 60 lumens of usable light on high, and a 35 hour runtime on low. Usb rechargeable, dimmable and IPX6 weatherproof. Press and hold the on/off button for 10 seconds to get out of demo mode. Bright led light with 350 lumens, built-in carabiner and magnets so it's quick to hang anywhere. Adjustable shade design for broad area light or warm lantern light with high/low settings. Goal Zero Boulder 200 Watt Briefcase Monocrystalline Solar Panel - Requires a goal zero Sherpa Power Pack or Yeti Power Station. Built-in junction box with smart-charging chip, allows you to power handheld USB and 12 Volt gear from the sun. Lightweight 2. 4oz and bright 150 lumen lantern, 120 lumen flashlight. In a pinch? it also charges from any USB port via micro USB cable included. Crush it. The crush light also features a soft, candle flicker mode for ambiance. Charge it. Goal Zero 11407 - Run time of up 170 hours at low setting. Light it. This collapsible solar powered lantern is a lightweight companion to any adventure with 60 lumens of usable light on high, and a 35 hour runtime on low. Pairs perfectly with Goal Zero Nomad Solar Panels and rechargers. Engineered to solar recharge Goal Zero Yeti Portable Power Stations. The crush light is as easy to store as it is to use, collapsing to just over half an inch. Please note: this light arrives in demo mode. Foldable and portable for use anywhere. Optimal operating temp: 0-120 F -17-48 C. Highly efficient mono-crystalline solar pumps out more power per square inch. Usb rechargeable, dimmable and IPX6 weatherproof. Goal Zero 11407 AAA NiMH Rechargeable Battery 4 Pack with AAA Insert for Guide 10 Plus - Requires a goal zero Sherpa Power Pack or Yeti Power Station. Built-in junction box with smart-charging chip, allows you to power handheld USB and 12 Volt gear from the sun. Perfect for an outdoor camp or inside a tent. Chainable with up to 8 lights. Low-power draw for extended runtimes. Lightweight, 200-watt monocrystalline solar panel with briefcase folding enclosure. Goal Zero 22013 - Smart charging technology -features two USB ports capable of dishing out 2. 4a at the same time. Patented chaining technology combines Goal Zero Nomad panels for faster charge times. Perfect for an outdoor camp or inside a tent. Chainable with up to 8 lights. Low-power draw for extended runtimes. Ideal for camping, emergency, or off-grid situations. Engineered to solar recharge Goal Zero Yeti Portable Power Stations. Waterproof in use - spray it down, take it to the beach, leave it in the rain - and never worry about rubber plugs. 66. 9 wh, 17, 700mah power pack - power phones 5-6x, tablets 2x and more. Lightweight and affordable. Usb rechargeable, dimmable and IPX6 weatherproof. Goal Zero 22013 Venture 70 17700mAh Power Bank with Lightning & Micro Cable Smart Charge Capability, IPX6 Waterproof Rating - Run time of up 170 hours at low setting. Pair with any goal Zero power pack sold separately and charge gear day or night. The crush light is as easy to store as it is to use, collapsing to just over half an inch. Please note: this light arrives in demo mode. With an ipx67 weatherproof rating & 17, 700mAh the venture will keep everything running smoothly. Goal Zero 32408 - Perfect for an outdoor camp or inside a tent. Chainable with up to 8 lights. Low-power draw for extended runtimes. Pairs perfectly with Goal Zero Nomad Solar Panels and rechargers. For use with guide 10 and can be recharged with Nomad 7. Waterproof in use - spray it down, take it to the beach, leave it in the rain - and never worry about rubber plugs. 66. 9 wh, 17, 700mah power pack - power phones 5-6x, tablets 2x and more. Light it. Removable kickstands Collapsible kickstand makes it easy to set up wherever you need it and helps optimize solar angle. The crush light is as easy to store as it is to use, collapsing to just over half an inch. Please note: this light arrives in demo mode. Goal Zero Boulder 100 Briefcase, 100 Watt Monocrystalline Solar Panel - Run time of up 170 hours at low setting. Engineered to solar recharge Goal Zero Yeti Portable Power Stations. Us based solutions center Team Our friendly customer service team is located onsite in at our headquarters in Utah. Smart charging technology -features two USB ports capable of dishing out 2. 4a at the same time. Goal Zero 400 - Requires a goal zero Sherpa Power Pack or Yeti Power Station. Built-in junction box with smart-charging chip, allows you to power handheld USB and 12 Volt gear from the sun. Patented chaining technology combines Goal Zero Nomad panels for faster charge times. Comes with a 1-year limited warranty. Optimal operating temp: 0-120 F -17-48 C.
Perfect for an outdoor camp or inside a tent. Chainable with up to 8 lights. Low-power draw for extended runtimes. Run time of up 170 hours at low setting. Ideal for camping, emergency, or off-grid situations. Pairs perfectly with Goal Zero Nomad Solar Panels and rechargers. Rechargeable nickel metal hydride batteries. Goal Zero Yeti 400 Lithium Portable Power Station, 428Wh Generator Alternative with 300 Watt 1200 Watt Surge AC inverter, USB, 12V Outputs - Provides power for small appliances, tablets, cameras, CPAPs and more. Recharges from AC or pair with a solar panel sold separately. Lithium ion battery with 9. 62wh capacity. Ideal for camping, emergency, or off-grid situations. Comes with a 1-year limited warranty. GOAL ZERO 22008 - Lightweight and affordable. Press and hold the on/off button for 10 seconds to get out of demo mode. Bright led light with 350 lumens, built-in carabiner and magnets so it's quick to hang anywhere. Adjustable shade design for broad area light or warm lantern light with high/low settings. Waterproof in use dunk it, spray it, use it in the rain; Power that handles whatever Mother Nature can throw at you; No rubber plugs needed. For use with guide 10 and can be recharged with Nomad 7. Solar ready built-in charging tip; no extra cables to lose; Charge up in 4 hours from USB - in 9 hours of full sun from the Nomad 7. Waterproof in use - spray it down, take it to the beach, leave it in the rain - and never worry about rubber plugs. Goal Zero Venture 30 7800mAh Waterproof Power Bank, Dual 2.4A USB Ports - 66. 9 wh, 17, 700mah power pack - power phones 5-6x, tablets 2x and more. Engineered to solar recharge Goal Zero Yeti Portable Power Stations. Pairs perfectly with Goal Zero Nomad Solar Panels and rechargers. Ideal for camping, emergency, or off-grid situations. Pair with any goal Zero power pack sold separately and charge gear day or night. Built-in micro usb tip tangle-free charging for phones and tablets; Certified cables for efficient charging. Comes with a 1-year limited warranty.